Are you experiencing problems within your plumbing system? Clogged drains? Leaking pipes? Water heater leaving you in the cold? We can fix that! 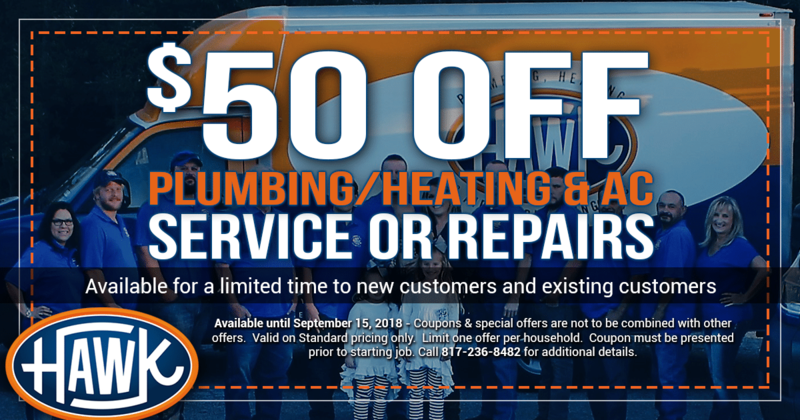 Hawk PHAC has been serving the residential plumbing needs of Fort Worth residents for over 30 years. Our highly trained and experienced plumbers can handle any plumbing need that arises within your home. As a local & licensed plumbing company, you can rest assured our team of dedicated technicians will help you navigate through the stress that plumbing problems often bring. We do this by making appointment scheduling easy, show up on time and get your repair fixed right, the first time. Residential Plumbing Repairs: Plumbing repairs can seem like a daunting task, full of frustration and of course plumbing problems happen at only the most inconvenient times. At Hawk PHAC we understand how you feel and know that you need your repair done as quickly as possible to get back to the things that matter in life. Nobody ever wakes up hoping today is the day a pipe breaks or a drain clogs, but these things happen. When they do call Hawk PHAC for fast, professional and affordable service! Residential Plumbing Installation: When installing new parts into your plumbing system it is wise to have a licensed plumbing professional handle all the details. When you call Hawk PHAC, our team of technicians are trained to handle any plumbing installation job that will arise in a residential property. We only use quality parts and take pride in our workmanship! We ensure your new system is in place and works correctly with the other parts of your plumbing before we leave. Residential Plumbing Maintenance: Hawk PHAC offers residential plumbing maintenance that helps keep your plumbing system running in peak performance year around. Maintenance includes; a full inspection of your plumbing system to look for potential plumbing problems before they become a disaster. Our maintenance program makes sure your plumbing system is running correctly, from drains to water heaters, Hawk PHAC has you covered.